Bo Scarbrough could fill a role similar to LeGarrette Blount's. The Philadelphia Eagles have made three picks so far in the 2018 NFL Draft. They have two to go, with one each in the sixth and seventh rounds. Here are 15 players who would make sense for the Birds in the sixth round. • John Kelly, RB, Tennessee: The Volunteers didn't know what they had in Alvin Kamara, who was laughably underused in college before becoming the NFL's Offensive Rookie of the Year in 2017. As such, you can probably throw out Kelly's pedestrian stats. Despite smaller size, Kelly breaks tackles, is a tough runner, and has some ability as a receiver. • Bo Scarbrough, RB, Alabama: Alabama is a running back factory, and Scarbrough is the latest Crimson Tide back likely to be drafted into the NFL. He also has low mileage, as he sat behind Derrick Henry in 2015 and has shared the load with Damien Harris in 2016 and 2017. 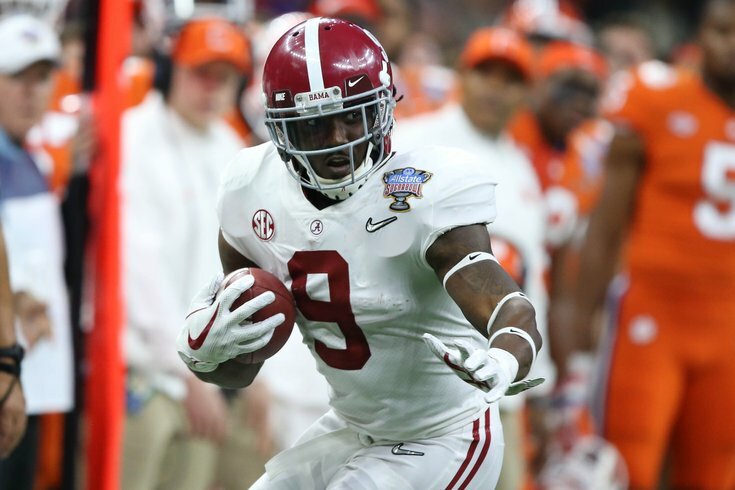 In 2016, Scarbrough did the bulk of his damage in the playoffs, carrying 46 times for 364 yards and 6 TDs in his three games against Florida (SEC Championship), Washington (Peach Bowl playoff game), and Clemson (National Championship Game). He is a physical runner in the same mold as Eagles running backs LeGarrette Blount and Jay Ajayi, but has some injury history. • Akrum Wadley, RB, Iowa: In each of the last two seasons Wadley topped 100 yards, but his 4.4 yards per carry in 2017 are concerning. He did catch over 60 passes during that span. While Wadley does not possess great size, he gets up to top speed quickly and is able to make jump cuts without slowing down. His lateral agility in reminiscent in some ways of LeSean McCoy, but with less explosion. Wadley also has ability as a receiver (over 60 catches the last two seasons combined), which adds to his appeal in a west coast offense. • Josh Adams, RB, Notre Dame: After a pair of productive seasons as a freshman and sophomore, Adams was having a monster junior season this year, as he worked himself into the Heisman discussion, before falling off. Adams offers very little in the passing game, both as a receiver and as a blocker, and he explosion as a runner isn't on par with many of the other backs in this draft. • Deon Cain, WR, Clemson: Cain is the next in line of really godd receivers to come out of Clemson. Cain, like Washington above, has good speed and is a threat to take the top off a defense. Additionally, he has good hands, great body control, and is thought of as a good blocker. For Cain to have lasted this long, there must be character and/or medical concerns. • Marcell Ateman, WR, Oklahoma State: Ateman doesn't have great speed, but he's big (6'5), he can win contested catches, and he has good hands. In that sense, he can be a player the Eagles could groom in the Alshon Jeffery role. • Duke Ejiofor, DE, Wake Forest: In 2016, Ejiofor had 50 tackles (17 for loss), 10.5 sacks, 2 forced fumbles, 2 fumble recoveries, 4 batted passes, and a pick. In 2017, he tore his labrum in his right shoulder, which likely occurred the first week of October. Playing hurt all season, Ejiofor's numbers dipped, as he had 43 tackles (17 for loss), 7 sacks, 1 forced fumble, and 1 batted pass. He reportedly had successful surgery to repair his labrum early in February. At Wake, Ejiofor also played inside on obvious passing downs, like Graham and Bennett have done over their careers. He could be a player who the Eagles like as a long-term successor to Bennett. • Cedrick Wilson, WR, Boise State: Cedrick Wilson doesn't have ideal deep speed, but he makes plays down the field. In just two seasons, he racked up over 2600 receiving yards, and averaged 19 yards per catch. Unlike Shelton Gibson a year ago, Wilson runs the full route tree, makes guys miss after he has the ball in his hands, and I love his tenacity as a blocker. Wilson could be an immediate special-teams contributor and a guy who competes for meaningful reps in the offense, with No. 2 starter upside. • Richie James, WR Middle Tennessee State: James is one of my favorite prospects in this draft. In his freshman and sophomore seasons, James was incredibly productive, tallying just under 3,000 receiving yards those two seasons. In his junior season, a broken collarbone derailed his season. James lined up all over the field for MTSU, including the backfield, and was occasionally even used as a running back. In his college career, James has 60 carries for 542 yards (9.0 YPC) and 5 TDs. In the pros, he's likely going to be a slot receiver. Though he's only 5'10, 183, he plays much bigger and reminds me a little of Steve Smith (the good one). • Ryan Izzo, TE, Florida State: Izzo isn't ever going to be thought of as a workout warrior, as he ran a 4.94 at the NFL Combine, in addition to some other ugly numbers. He's also not exactly the best receiving prospect coming out of this class at the tight end position, as his best season was in 2017, when he had 20 catches for 317 yards and 3 TDs. BUT, again, like Schultz and Smythe above, he can block, and has some nasty to his game. • Desmond Harrison, OT, West Georgia: Harrison destroyed inferior competition in the D-II Gulf Sun Conference, and is a highly athletic developmental prospect that Jeff Stoutland could try to work his magic with over the next couple years while riding the inactive list. Harrison is old (I don't have his age, but he's been in college since 2011), he has off-field concerns, and he has to put on more "good weight" if he's going to make it in the NFL. • Kylie Fitts, DE, Utah: Fitts had an injury-riddled career at Utah, after transferring from UCLA. However, when he played, he was a productive pass rusher. The Eagles have shown that they will take chances on players with injury concerns, and Fitts could be a high-reward player if he can stay healthy. • Tremon Smith, CB, Central Arkansas: Jim Schwartz loves him some finger-wagging corners, and Smith is thought of as a gambling, confident corner who produces turnovers. In 2017, Smith had 5 interceptions, and was Central Arkansas' primary punt returner. • Levi Wallace, CB, Alabama: Wallace had excellent production when he was targeted this season, statistically, according to CFBFilmRoom.com, as he allowed just 25 receptions on 63 targets. Wallace has a slight build at 179 pounds, but he a willing and capable tackler, with good ball skills. He is a former walk-on who had to earn everything he got, and he could be a bargain in the late rounds. • DeShon Elliott, S, Texas: Elliott is a big, 6'2, 210-pound safety with ball-hawking skills, though a number of his forced turnovers fell in his lap. In 2017, he had 6 INTs, with 127 return yards and 2 pick-sixes. He has also forced 3 fumbles, and has 9 pass breakups. I wonder if the Eagles might view Elliott as a linebacker prospect.